This gorgeous Baton Rouge bride selected Race and Religious for her bridal portrait session. I had actually photographed the weddings of her brother and her sister, and it was wonderful to have a chance to work with this family a third time. This fascinating wedding venue has many interesting nooks and crannies, great textures, and is a fun place to shoot. It's pretty much a playground for wedding photographers! 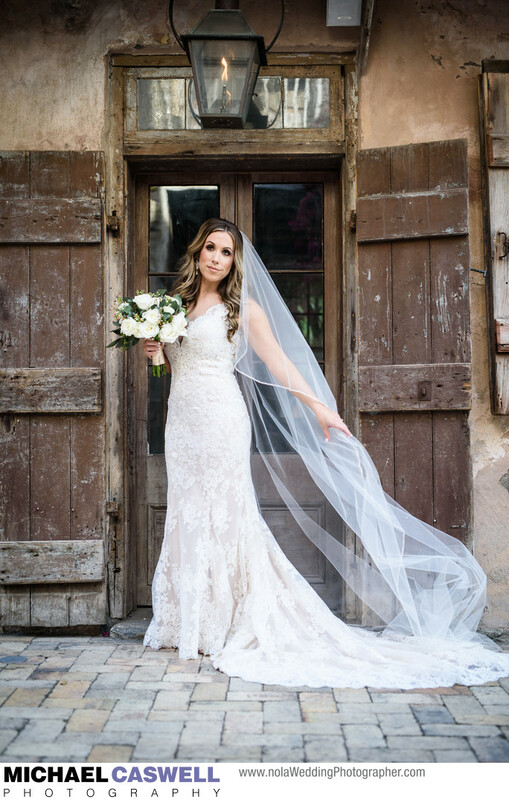 Although the French Quarter as a whole also has an abundance of great spots for portraits, Race and Religious has its own unique and instantly recognizable look, and also has the benefit of being more convenient and less stressful for brides. There is a room for brides to change into their wedding dress, and the privacy and lack of chaos afforded by this enclosed compound is very much worth the expense. Constructed in the 1830s and named for the intersection of the two streets at which it is located, this Lower Garden District venue features several buildings, courtyards, doorways, balconies, and walls that photograph very well, along with some beautiful interior spaces. The two main houses were originally separate properties, before being combined into the present configuration about a decade ago, and has been the subject of a tremendous amount of absolutely amazing renovation work. It's also an amazing place for a wedding, and has even been featured as a filming location for countless motion pictures, television shows, and music videos. Location: 510 Race Street, New Orleans, LA 70130.